The latest reminder of who’s boss? The score of this year’s Iron Bowl supposedly sown in ryegrass in the dead patch of lawn in front of the recently stickered statues of Bear Bryant and Gene Stallings. In order to keep the pranks perpetrated to rub it in, stick it on, and now spruce it up to the University of Alabama in the proper perspective and from leading to more threats of retaliatory Toomer’s tree-poisoning, i.e. actual vandalism — sorry, but easily removable stickers and actual improvements to the grass don’t really count — we feel compelled to suggest to Bama fans the slight possibility that one of their self-loathing own may be responsible. There is, after all, historical precedent. I think it’s funny, but some crazy Bammer is going to start hiding out in those trees with a gun if this person doesn’t watch out. While I love your work, gutsy Auburn fan in Ttown, I want you to be around to pull this kind of stuff for years to come. So maybe you should hang low for a while. With these pranks, I am very worried that Toomer’s corner trees will be spiked or burnt to the ground. Retribution is not funny. The sticker and grass was funny, but as I get older, I worry about teasing the neighbor’s pit bull. You think this is bad, you shoulda seen all the litter in the street after the attempted “Tiger Walk” this year in Tuscaloosa. And we wonder why Cyrus thought twice about going to Auburn? He’s smarter than doing silly pranks like this. Roll Tide. How dare ANYONE come plant green grass in our lovely dead lawn? What a terrible act of vandalism, nay, ECO TERRORISM!!! When will the children ever learn? Deplorable acts of irresponsible gardening MUST STOP NOW!! Admin, could you please color the preceding text purple to note the sarcasm? On a serious note, that really stinks about the litter during tiger walk. It seems like more and more people in any sort of festive atmosphere seem to forget there’s a proper place to put the trash. 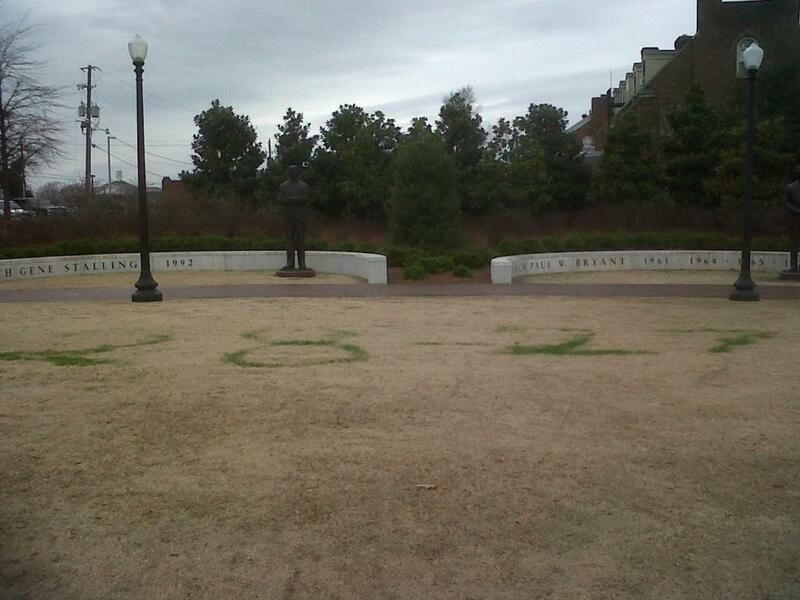 I can only hope that my fellow AU supporters weren’t inclined to litter just to deface the UA campus. It’s the exact opposite of planting green grass, and actually IS deplorable. Very apt coming from the state’s Ag school. These are the kind of acts that go down in lore. It is certainly not a hate crime. Hopefully the tide can be as creative. I consider it friendly banter. this was a harmless prank…. but classless bama just poisoned our tree that stood there for 130 years.. what about classless rednecks..
How are those oak trees feeling? Not so much funny banter now, huh? Unfortunately this is what inevitable happens in these situations. Each “prank” is more dramatic than the last until it gets completely out of hand. I just see this entire situation going down hill fast. There has been vandalism at both campuses over the years and it has finally gone to far. I’m just afraid next time it won’t be trees being hurt but something far greater. Just wonder if Auburn fans will be just as outraged when the retaliation occurs or will it be just as funny as you all thought this “prank” was… By the way, both acts are considered Class C Felonies. You all should be ashamed of yourselves. Classy? Auburn fans are the farthest people from it. Throwing rocks, food, and alcohol bottles at opposing teams’ fans, this display on the campus of the University of Alabama along with littering on purpose, and just general rude attitudes to all will cause me never to willingly to step foot again in “God’s Country” or whatever you people call it. You can say what you want about some crazy man poisoning your trees, but I’ve honestly never seen more drunk, rude, unclassy fans than when I was at Jordan Hare Stadium, and that includes being at Death Valley.